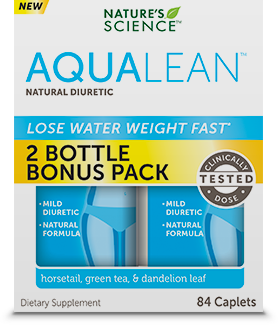 Nature's Science AQUALEAN™ is natural diuretic that helps you lose water weight fast! * Nature's Science AQUALEAN contains pure and natural ingredients such as horsetail, green tea and dandelion leaf. Nature's Science AQUALEAN contains pure and natural ingredients such as horsetail, green tea and dandelion leaf. Nature's Science is manufactured in a GMP-compliant manufacturing facility to ensure 100% quality.